A deaf bicyclist was injured when he was clipped by a semi-truck. The incident occurred near the end of his 10,000-mile ride to raise awareness for the hearing impaired. Six months ago, Jacob Landis and his cousin set out on their long ride, which was scheduled to end in Miami. According to First Coast News, they were only 200 miles from their destination when Jacob Landis was clipped by a semi-truck trailer and fell off his bike. When emergency responders arrived, Landis was lying on the shoulder of the roadway, disoriented and bleeding. His hearing apparatus had been knocked loose during the collision, keeping him from communicating effectively with responders. He was taken to a local medical center, where it was determined that he had suffered road rash, a fractured cheek bone, a broken nose and a concussion. Landis wanted to get right back on the bike, but his doctors cautioned him to rest for at least a couple of weeks. Landis, who was born with normal hearing, went deaf when he was about two years old. He remained deaf until he was 10, when he received cochlear-implant surgery. This year, he decided that it was time to help others who are in need of the surgery but cannot afford it. He rode his bike from baseball stadium to baseball stadium, promoting his cause and asking for donations to help fund cochlear implants for the less fortunate. To date, he has raised more than $140,000. Beyond cochlear implants, Landis’ ride now serves to remind us of the dangers that cyclists face every day. 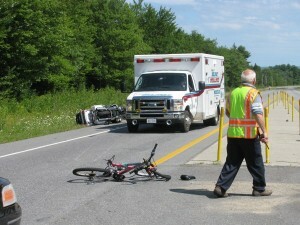 More than 500,000 bicyclists visit emergency rooms due to serious injuries each year. It’s important for all bicyclists to ride safely by wearing a helmet, obeying traffic laws and staying attentive to the traffic around them. It’s also important that motorists remain alert and never become distracted while driving. The obvious difference in weight between cars and bicycles means that collisions often leave cyclists with serious injuries. Many bicycle accidents are caused by negligent driving, which includes turning sharply into a cyclist’s path, recklessly passing a cyclist and underestimating the speed of a cyclist. There are more than 85 million bicyclists in the United States, so it’s imperative that drivers check their mirrors carefully and maintain road awareness every time they get behind the wheel. If you are a cyclist who has been involved in an accident with a motorist and you believe that your injuries are the direct results of the driver’s negligence or inattention, contact an attorney to discuss your case. You may be entitled to compensation that can help cover the costs of emergency room visits, surgeries and rehabilitation. At Wolfson Law Firm, we are dedicated to helping Miami-area bicyclists recover the compensation that they deserve. To schedule a free case evaluation, Call Us At 305-285-1115 Today!